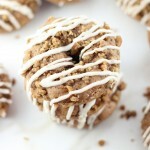 Simple baked spice cake donuts with a pecan streusel topping, and a drizzle of brown butter icing! This is the first of many, MANY recipes coming up this fall that will include brown butter. I think I browned 2 lbs. on Sunday alone. Every time I started a recipe, I was browning more butter. At least 4 separate times. A smart person might’ve done it altogether, but I am evidently not that smart. I like to create more work for myself. In between all that butter browning, I also managed to make an abundance of other wonderful fall treats that I can’t wait to share. Unfortunately, I never opened a single can of pumpkin. I can’t even believe it because I specifically set out to make all the pumpkin things. Next weekend, for sure. I did, however, manage to make peppermint bark. Uh-huh, you read that right. Nope, I’m not a lunatic, not that I’m aware of. Though a lunatic would hardly know if they were. Anyway, it just happened that I was already making a different type of chocolate bark, a much more seasonally appropriate type of chocolate bark, and I thought that I might as well just get this one out of the way too. I would be unusually ahead of things. Christmas in August. What’s most surprising about this, if it’s not surprising enough to make peppermint bark in August, is that I easily found candy canes, but when I sent my S.O. out on an errand to pick up candy corn, he couldn’t find it. What kind of preposterous world do we live in where you can’t find Halloween candy in August?? But Christmas decorations are out at HomeGoods and Sam’s Club. Right??? RIGHT??? It’s madness. This time of year, I want to stop time. I love everything about fall. I probably already have more recipes for fall than I will be able to post. I will forge ahead anyway, cans of pumpkin in hand. 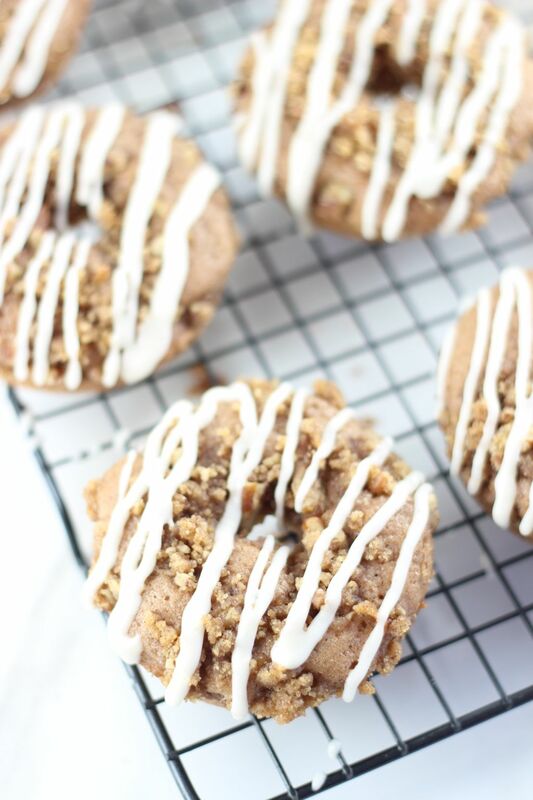 One of my favorite recipes so far this season is these baked Spice Cake Donuts with Pecan Streusel and Brown Butter Icing. I love a good donut – I don’t think I even need to tell you that though. If it’s baked, even better. 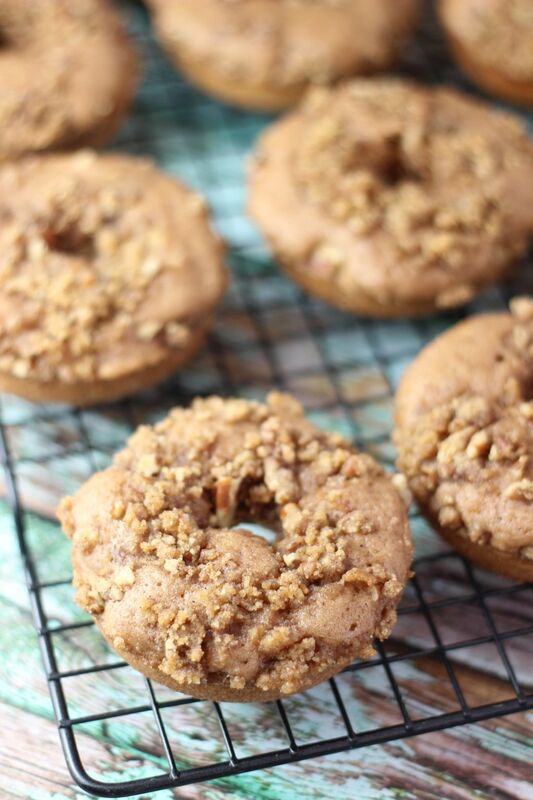 Easier to make than fried donuts, and they produce slightly less guilt. Most donuts are topped with glaze or icing, yes? 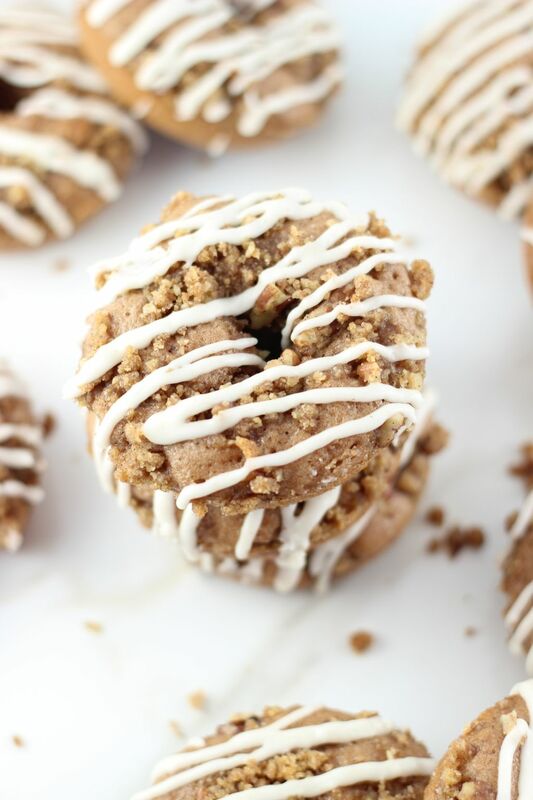 These are not only topped with a nutty, rich, and caramel-like brown butter glaze, but a cinnamon and pecan streusel too. 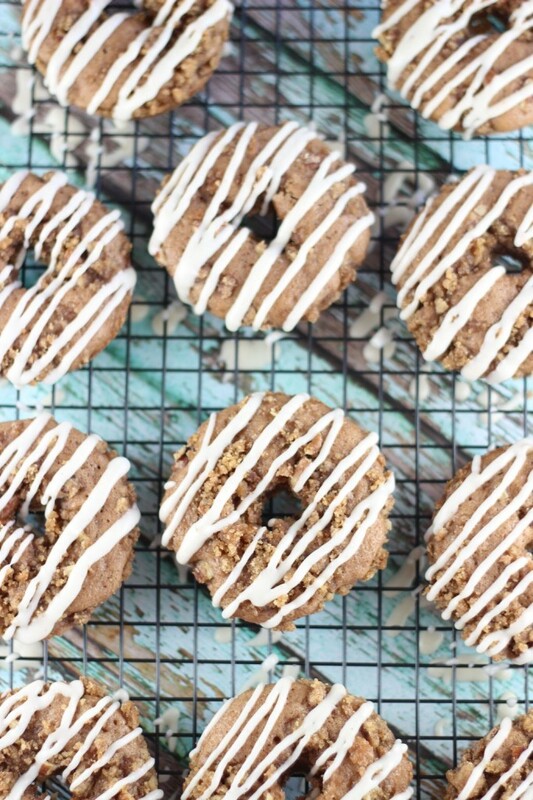 These donuts are simple to make, and anything but ordinary. All good things in life are topped with streusel. And brown butter. In a large bowl, combine cake mix, egg, water, oil, and melted butter. Mix until well-blended, a few lumps will remain. Pour batter into a gallon-sized ziploc bag, and snip off the corner of the bag. 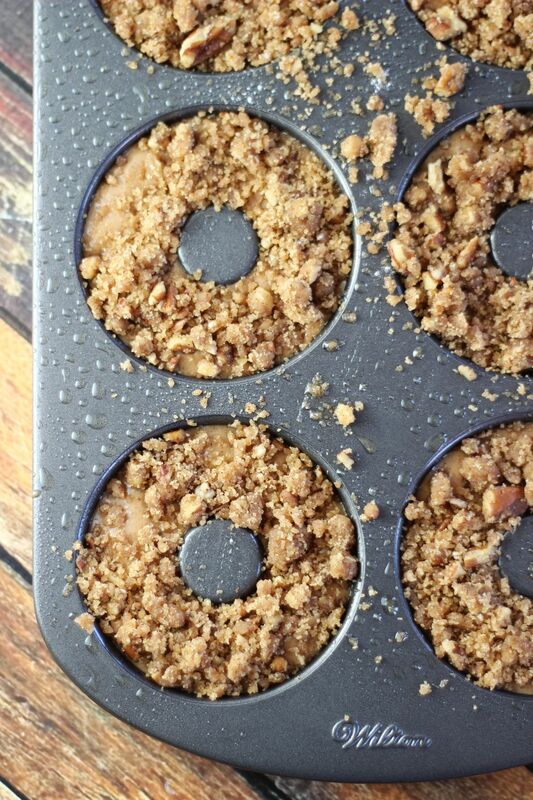 Pipe the batter into the baking pans, filling each donut cup about 3/4 full - almost right up to the center 'hole'. In a medium bowl, combine brown sugar, flour, and cinnamon, stirring until well-blended. Mix until it resembles coarse crumbs. 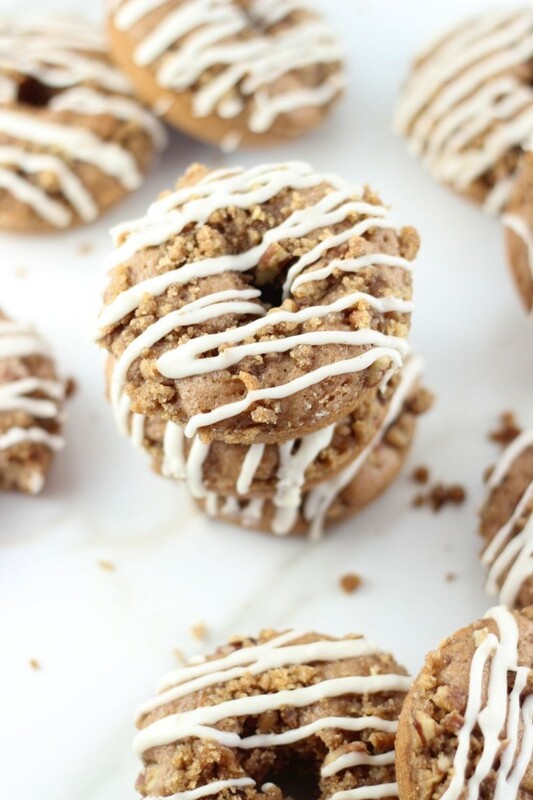 Sprinkle a generous tablespoonful of streusel on top of each donut. Bake at 350 degrees for 10-13 minutes, or until a toothpick inserted near center comes out clean. Allow to cool in pans for 10 minutes, then carefully remove donuts to a wire rack to cool completely. Place the powdered sugar in a medium bowl, and set aside. Remove from heat and immediately pour the browned butter and vanilla over the powdered sugar. 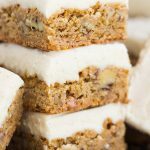 Whisk to combine, adding enough milk or water to form a thick, but slightly runny icing. Drizzle generously over the donuts. Enjoy! LOL! You make me proud! So glad you are rearing your kids to be donut fiends too!!!! Haha, I agree with you. Brown butter is awesome in basically ANYTHING!! It’s nectar of the gods! 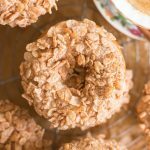 Donuts with streusel AND glaze?! YES! Pinning! 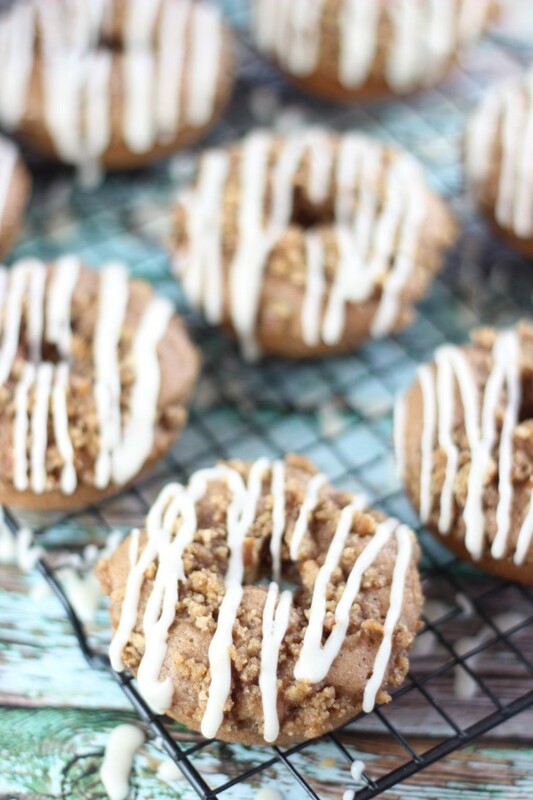 The perfect donut for fall! Now I just need to get the donut pan! 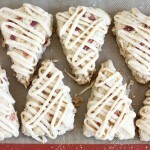 Thank you for linking up to Creative K Kids’ Tasty Tuesdays Linky Party. 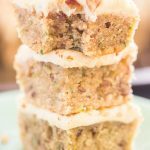 I have pinned your recipe to our Tasty Tuesday’s Pinterest Board. 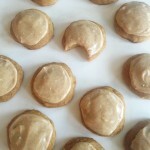 Yes, don’t let lack of a donut pan stop you from trying these! Grab some from Amazon, they are inexpensive! Thanks so much!